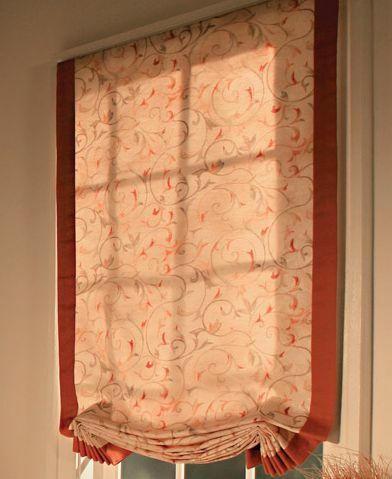 The slouch Roman shade is a soft shade with permanent round folds at the bottom. Similar to the relaxed style, they feature a center 'swoop' or 'smile'. Different from the relaxed style, the lift lines are set in from the edges of the swoop to create folds or 'ears' at the outer edges of the shade. Slouch Romans are also called 'dog-ear' shades for that reason. Some people call them swag-tail shades as well. They are flat when lowered except for the bottom rounded folds and 'ears'. 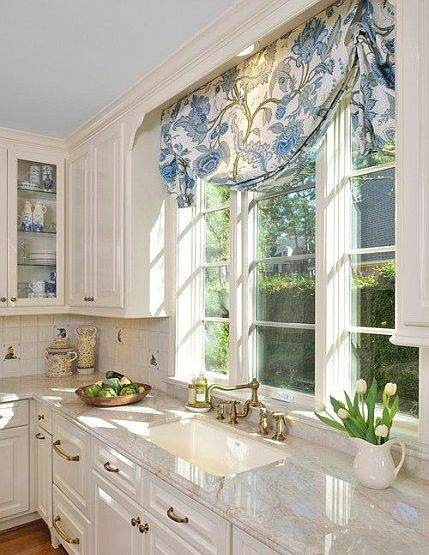 When the slouch roman shade is raised the bottom continues to gather soft folds at the bottom. 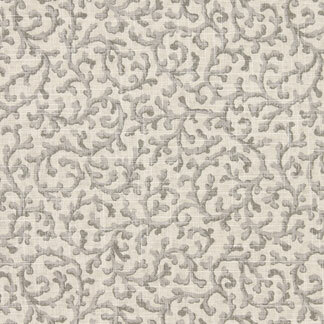 Less-tailored than some roman shade styles, their more whimsical look is ideal for bedrooms, kitchens and baths. This roman shade is a not a tailored shade and takes some dressing or fixing after raising and lowering. The slouch roman shade is a relaxed style shade and should be fabricated with medium to light weight fabrics. Outside mount is recommended, with the shades a few inches wider than the window, since slouch shades tend to 'hourglass' where the sides pull in toward the center of the window. To use as a fixed top treatment, a short shade can be adjusted to height and tied off. An easy blue in a brush stroked pattern: Cavalcade color Royal. Light filtering and a medium weight. Slouch shade cost: $561. Great in a kitchen or alcove. A floral pattern: Dusty Hues color Vintage Red. Mid weight, warm or cool based on the lining. Slouch shade price: $305. An outside mounted slouch shade with a contrasting vertical band. The banding adds vertical strength and a more structured look. A slouch Roman mounted outside the window trim. A beaded fringe along the bottom edge catches the sunlight and softens the fabric edge. Mounted inside a stepped window casing, this dog-ear shade escapes the light flare from the hourglass effect.